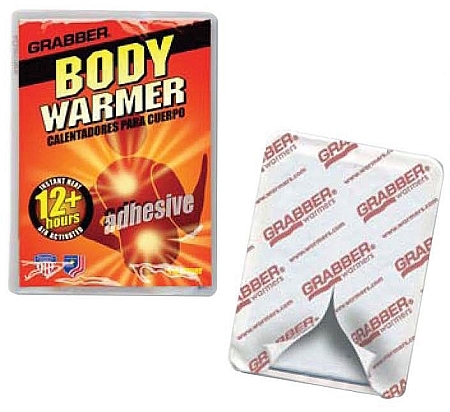 Grabber Body Warmers are "the portable heating pad you can wear"! They provide soothing comfort for minor aches and pains as well as extended everyday warmth during outdoor sporting activities. Simply stick the Adhesive Body Warmer to an inner layer of clothing to enjoy over 12 hours of heat. Warmers are standard equipment for skiers, snowboarders, hunters, campers, hikers, birdwatchers or anyone who works outside in cold weather. Case of 320 warmers: 8 display boxes of 40 each.